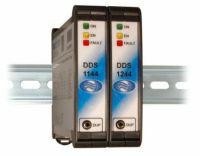 • Up to 4 programmable drive speeds selectable via I/O for applications requiring fixed speed drive, or setvalue on analog input. Other models and power ratings are available on request. Important note: Due to the high input current of the optocouplers, we recommend to connect the drive to the "Stepper interface board II" (art. no 1371) instead of a direct connection to the printer port. For fast and easy wiring, there is an adaptor cable available.